To End Workplace Violence and HarassmentPromote Pay Equity, One Fair Living Wage, Paid Leave, Labor Rights At WorkU.S. Department Of Labor, Washington, D.C.
Washington, DC – On International Women’s Day, Wednesday, March 8th, women are rising at a massive rally in DC – WOMEN WORKERS RISING. 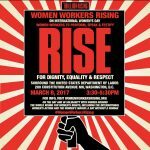 Women workers will come together and RISE for Dignity, Equality, and Respect at and surrounding the US Department of Labor in DC. Organizers are calling all women and allies to come and be in solidarity with women workers – for an end to workplace violence and harassment and to promote pay equity, one fair living wage, paid leave, and labor rights at work. This rally will be on the day – and in solidarity with – women around the world rising for women’s rights, including the International Women’s Action and The Women’s March: A Day Without a Woman. WHERE: Department of Labor, Washington, DC, 200 Constitution Ave.
Download and Share the Graphic!